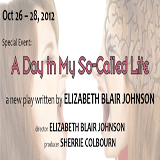 This new original play, written by Poway High School student Elizabeth Blair Johnson as her Senior Project, is being presented for a special engagement as part of our “New Playwrights” Series. Every parent with a teen will be familiar with the laughter and love in this fresh, fun and family friendly production. Go inside Paige Warren’s brain for one single day and discover a new definition of “talking to yourself.” The play takes a look at the awkwardness of being a teen—from the pressures of doing well in school to the pressures of fitting in with societal norms. The perfectly fitted cast of this laugh-out-loud funny show truly captures the thinking of today's Southern California teens.